There are just seven days left to get your iPhone 5 rumours in so hey, indulge us, as we look at three in one go. The latest from the people at iMore is that "recent parts leaks and dummy phones are accurate representations of what the new iPhone will look like". With a larger, 16x9 4-inch display (not to mention possible 4G), you're gonna need a bigger battery; and that's just what iResQ reckons you'll get. A 5.45 watt-hour 3.8 volt rechargeable juicebox was spotted by the repair site which went above and beyond by slotting it prefectly into a Frankenstein's monster style chassis of other leaked parts. 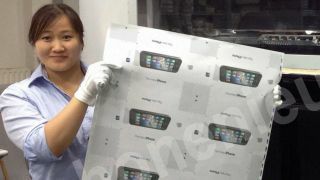 The folks at iResQ also compared the new battery to the old iPhone 4S one and found it to be slimmer, taller and lighter. Finally, iPhoneNieuwsBlog.nl thinks it has the box the next iPhone will come in, replete with "The new iPhone" text and a photo of the handset featuring the now-canned YouTube app. We think not, friends. We think not. Apple confirmed yesterday that the iPhone 5 bonanza event will take place on September 12 in San Francisco – we've got our best psychics analysing the event invite as we speak. Apparently there's a 5 in the shadow if you look hard enough.